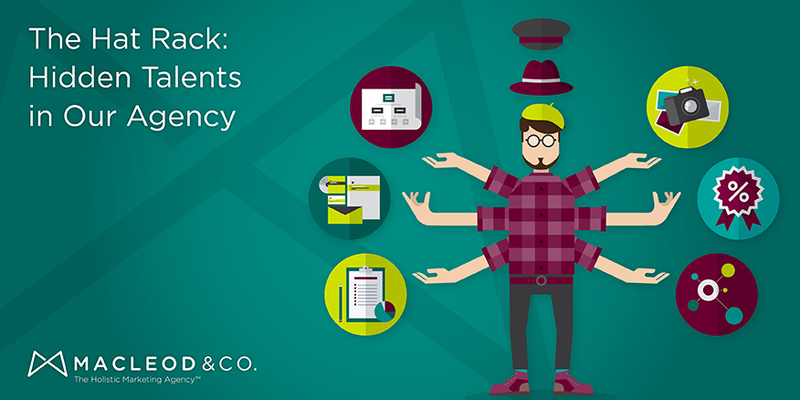 The Hat Rack: Hidden Talents in Our Agency | Macleod & Co.
As advertisers we get to wear a lot of hats. We work in a variety of industries. We get to do everything from research to mission, vision, and values to design. With such a wide assortment of work, I’m glad we have a multi-disciplinary team with a wide range of passions and hidden talents. Here are just a few of the hats on our lobby rack. Noah (Art Director / UX Designer) is the commissioner of a Fantasy Football League (he says they call him “The Dictator”). He loves organizing information and complex details. And it shows — he has quite a talent in bringing structure to chaos in a beautiful and meaningful way. Emily (Account Executive) is a competitor at heart. She runs 10k and 15k races in her free time and brings that drive and determination into everything she touches inside and outside of work all while still having fun. A winning combination. Diana (Director of Brand Strategy) is a bonafide comedian. Before moving to Minneapolis, she did stand-up in New York. It bubbles through pretty much everything she does. Even a straightforward press release has an extra measure of panache that could only come from the mind of a creative genius. Tanya (CEO & President) started her career as an art director but quickly discovered she was a strategy ace. She still lives in the world of strategy 24/7, but her creative roots and ongoing love affair with art (she still paints and does pen and ink drawings) allow her to visually interpret strategy and appreciate great work when she sees it. Erin (Art Director) loves creative problem solving and it shows in her cooking. She isn’t content just following a recipe. Erin loves experimenting, inventing, and perfecting until a dish becomes her own. Not unlike another process she goes through on a daily basis, now is it? Lisa (CFO) is a certified yoga instructor and top notch gardener. She knows the in’s and out’s of process, discipline, and the art of cultivation. She doesn’t just see numbers on a page, but the holistic view of how that impacts the bigger picture. Jennifer (Creative Director) is a storyteller. She was recently selected to participate in the St. Paul Moth GrandSLAM. We weren’t surprised. We’ve always known she has an incredible way with words and totally mesmerizes her audience — in person or on page. It was about time the Twin Cities found out. Bryan (Director of Emerging Media) is an auto mechanic hobbyist. His friends and family often bring their car problems to him; he even knows how to rebuild a carburetor. Social media requires equal parts innovation, exploration, and a passion for intricacy — Bryan has it in spades. Chris (Agency Director) has studied psychology extensively. She deciphers what motivates individuals, how to care for people, and is always digging deeper for a more thorough understanding. I’ve seen her decode people in what feels like seconds. We are in awe of her acute read on the world. I (Kelly – Account Executive) minored in photography in college and have the good fortune of being able to use that at work (anyone need a headshot?). My studies also developed a deep appreciation for beautiful design, art, and working alongside creatives. I love our team. Everyone has different backgrounds, different skills and different passions — and many hidden talents. It’s part of what makes working at Macleod & Co. fun and interesting. And when all the cogs do unique things with their many hidden talents…great work happens. The American Work Ethic is Nonsense, Go On Vacation!